It's interesting how the creatures have evolved since I first started working on the game. For my first drafts the animals were just words. So I had to be pretty descriptive, allowing the player's imagination take over. As I worked on the names, I drew inspiration, believe it or not, from The Lost World: Jurassic Park. In the movie there is a scene where the hunters are in an open field in their modified vehicles trying to capture a bunch of the dinosaurs. At one point the leader is in a jeep trying to tell one of the vehicles to go after capturing a Pachycephalosaurus. But as you would suspect he can't say the word Pachycephalosaurus. Irritated he throws the reference book he was using aside and tells them to capture "Friar Tuck!". I started thinking about thinking about how explores of new worlds would name the indigenous life they came across; and I realized it would be exactly like that. Scientist would come in and classify the animals, giving the scientific names. Put most people would just name them after earth animals they resembled or mythical creatures the animal reminded them of. Wanting to keep the feel of the game as authentic as possible I decided to follow suit. Even with that inspiration, I can tell you though coming up with names is not as easy as you would think. That first night, sitting at the bar in Kansas City, I think the beer helped a bit. I also drew on ideas from friends. Nymphadrax, was a name proposed by one of my friends daughters, Sarah. While my friend James came up with the name Ignasraptor, which I ended up using for the scientific name of the Flaming Eagle. Other creatures were obviously right out of lore. Babe for instance, pays homage to my Wisconsin roots. Though I'm not sure if Paul Bunyan would recognize his friend. 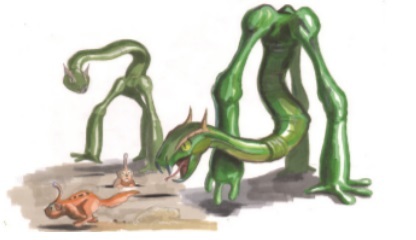 And what creature game isn't complete without it's own version of the Jack-a-lope. Jeff's drawings affected the names of several creatures. The Puff Duck is an example of this. When I first named this creature, I called it the Paddle Duck. In my mind, I envisioned a creature whose wings acted like paddles that just twirled around. A little like a paddle wheel. Now when I gave Jeff the name Paddle Duck for a creature, I didn't tell him what I was envisioning. So I was a bit surprised when I saw the first sketch. It was definitely not what I had envisioned but it was so cute. I thought it looked like a big puff ball. I decided right then to changed it's name to Puff Duck rather than ask Jeff to draw a new image. And I'm glad I did, the Puff Duck is just about everyone's favorite creature. 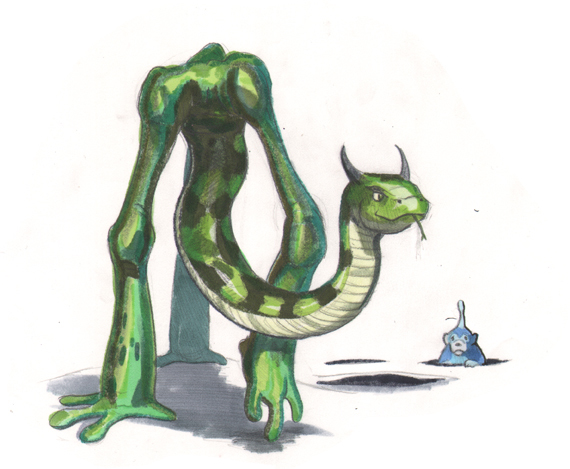 Vega's Viper is another creature where having a the artwork helped with coming up with a great name. It was originally called the three-legged snake. And Jeff did a great job of envisioning a three-legged snake with his first sketch. After he mocked up a color version of the creature, I started thinking about what an explorer would name this creature. It obviously resembled a viper, add in the star Vega, to make it spacey, and wah lah ... Vega's Viper . This, also, lead to other ideas like how it moved. The idea struct, what if the creature could rotate its "hips" all the way around allowing the neck to either come from the top or the bottom? We wanted to make the game a rich experience for the players. So we tried to add little details like this where ever we could. Most of the creatures went pretty smoothly but not all. Sometimes it took a while to get the creatures to have the right feel. One of the few creatures I had Jeff really tweak was the Cabbit. It was originally named the 6-toed cat, after a cat that I had many years ago AC. He had six toes. 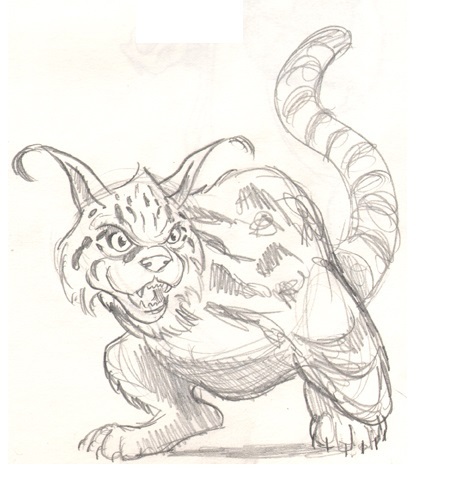 But the first drawing of the 6-toed cat just didn't hit me as right. Neither did his second sketch. But looking at the first sketch, and seeing how over sized the hind legs seemed to be, gave me the idea of having an animal that was a cross between a cat and a rabbit. Rat wouldn't work obviously. But Cabbit, now that would work. Funny side story, no I didn't look it up on the internet. So I had no idea that a Cabbit was actual the name a creature in folklore. Interesting, but not surprising coincidence. Anyways, I proposed that idea to Jeff and his next sketch was spot on. I look forward to sharing the rest of the creatures in the final deck. Jeff and I have worked hard to really make sure the creatures seemed like something that could exist and that fit into the habitat and exhibited the characteristics we attributed to them. And we look forward to your feedback. Let us know what you like about the creatures and what you don't.